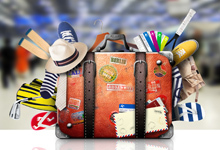 Travelling Abroad – Do You Have To Declare Your Personal Possessions On Re-Entry? Catastrophes like floods and fires do occur and there is insurance to cater for these types of events. There are two different types of insurance cover for these events – one to repair or replace the assets damaged (your normal insurance policy) and one to compensate you for the losses incurred during the time it takes to get the business going again. 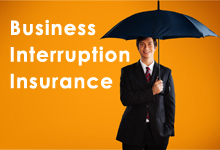 This latter one is known as ‘Business Interruption’ or ‘Loss of Profits’ insurance. Statistics show that nearly three out of four businesses never recover from a catastrophic event and it is therefore important to ensure that your Business Interruption insurance has been carefully thought through. You need to have a good grasp of your costs and expected sales and gross profit. You don’t want to underinsure so if your business is growing reflect that fact – for example if you expect 10% growth (and trends in your business justify this) show this to insurers or you won’t get paid out this additional amount. It is important to make sure that all your projections are well grounded and can be defended as they will be closely scrutinised by loss adjustors in the event of a claim. Thus, the better you understand your costs, the less chance of having a claim either rejected or adjusted downwards. Another critical factor is the indemnity period. This is the time you will be covered for whilst out of business. For example, if you put a six-month indemnity period in your policy, you will only get paid out for six months even if it takes twelve months to get the business back on its feet again. Bernie has a cosmetics factory and his year end is 31 December. On January 2, the factory burns down. It will take 12 months to get the factory up and running again. *Adjusted gross profit plus your incurred costs. **Variable costs which will not be incurred in the 12-month period of re-establishing the factory. ***Putting together claims is a time-consuming task, so include it in your policy. NB! 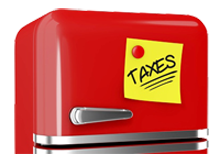 Include VAT in the assured amount as insurance pay outs include VAT. You can see from this simple example that this is a very complex process – spend time with your accountant getting to grips with your revenues and costs. Also use a reliable insurance broker. Remember that 43% of businesses that suffer a catastrophe never trade again and a further 29% go out of business within two years. 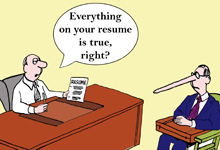 Not surprisingly, considering what we hear every day in the news, employers are finding that candidate employees are more and more embellishing and misrepresenting aspects of their career, as well as omitting embarrassing aspects altogether. It is also getting increasingly difficult to get a thorough picture of a candidate for a position due to increasing restrictions being placed on personal information. This tends to make previous employers nervous to share information on their employees and more and more employers are now giving out no information at all. The consequences of making a mistake when recruiting are damaging as the process is time consuming and adversely affects staff morale, which can lead to a business losing or making less money. The relationship between employee and employer is based on trust. Abusing this trust by falsifying a CV breaks down this relationship as the employer begins to doubt what the employee is doing and this usually results in a downward spiral leading to disciplinary hearings and often dismissal. The business then has to start the whole recruitment process again. Labour courts have found that falsifying a CV is a dismissible offence and that there is no need to prove that the misrepresentation led to your decision to appoint the candidate. Whilst this is encouraging, in practice many cases end up being lost by the employer due to some procedural error found by the court. As noted above, it is becoming harder to obtain the true picture on a prospective staff member. Think perhaps of joining the many companies now using informal networks such as canvassing management in your organisation, or building up Human Resource groups in the applicable industry. Often this approach leads to the employer finding “someone who knows someone” and from there a more accurate picture of the employee’s past can be put together. Why not also pursue someone who commits a dismissible offence – if necessary charge the person and go through the full disciplinary process? Then, be honest with another employer as to why the employee left or was fired. This way at least it will spare other employers making costly appointments and who knows, it may begin to spread throughout the sector and come back to benefit your business directly one day. The ‘Peter Principle’ has been around for nearly fifty years. Recent research has underlined that it is still valid today. It has implications for how we promote staff and the effects this has on our business. It is usual in business that people get promoted when they are successful at their jobs. They get promoted despite the fact that very often the skills required for their new position are different from their old position. If they are successful in this position, they get promoted again and again until they lack the skills for the new position and then they experience failure. Once this has happened, they get stuck in their new role – as they are no longer successful, no more promotions are available for them. They have risen to the level of their incompetence. Most organisations are bedevilled with unhappy managers who spend years and years in the same job. Some researchers have even facetiously suggested that, as the skills required for one stratum of an organisation are completely different to those required for the next stratum of the business, why not promote the worst performing employees? This in Dilbert’s terminology shows that “leadership is nature's way of removing morons from the productive flow". Recent research of 214 companies reviewed 1,500 promotions in sales organisations. The research also looked at the characteristics of people promoted - whether they worked collaboratively or on their own (people who work collaboratively usually make effective managers). It showed that people were most likely to advance in the business when they were successful in their sales jobs although they were poor managers – in fact sales declined under these promoted managers. Conversely, those who worked collaboratively were usually not promoted. The new research shows that the Peter Principle is alive and well. 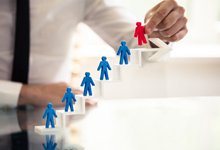 Whilst many businesses accept the trade-off of promoting successful employees at the expense of having less effective managers, it is appropriate to reconsider how staff should be promoted in an organisation. In the long run it almost certainly pays to promote those who have the potential skills to be good managers. To the high flyers who don’t have the skills to manage, recognise them and give them hefty bonuses. Finally, is it not better to move people who are not performing in a particular position either to another position where they can do a good job, or move them out of the company? This leaves the company with good managers and motivated staff as opposed to having frustrated blocked managers and lower performing employees. Events have moved swiftly in recent years. One of the largest South African conglomerates, Steinhoff, has virtually collapsed amidst allegations of dubious structures and transactions. Some of our largest state companies have it seems been ravaged by state capture whilst global icons such as KPMG and McKinsey have suffered serious reputational damage. A failure of governance links these entities together and there has been renewed interest in business ensuring that their organisations are well governed. It’s not a question of poor governance being practiced by the business community as a whole – the vast majority want to do the right thing and make every effort to achieve compliance throughout their organisations. One of the frequent criticisms of the free market system is the primacy of shareholder interests. These interests are often prioritised at the expense of other stakeholders as shareholders want to see the maximisation of profit. King IV talks of adopting an inclusive stakeholder approach in which business creates value for society. It recognises that business and the community are, in the long term, intertwined. Being a good corporate citizen is not just good for business but is a key part of obtaining legitimacy. 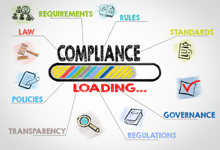 How easy is it to be compliant in South Africa? A Compliance Complexity Index was recently compiled to see how easy or difficult it is for countries to achieve compliance – 84 countries were surveyed. South Africa came in the last quartile. Generally, countries where corporate law is based on the common law fared the best. Thus, Ireland is rated the easiest country for compliance and countries where more complex laws are incorporated in their legal systems fared worst. The onus is on our authorities to simplify compliance for its citizens and businesses. There is some confusion over whether to declare your laptops, golf clubs, iPads and other such valuables that you travel out of the country with. The answer is no you don’t have to declare these items, but you do have to carry with you proof of purchase in South Africa of these goods and show it to Customs officials on request. Invoices or insurance policies are usually adequate proof for Customs. Alternatively, you may, when exiting South Africa, complete a TC-01 which digitally captures the relevant assets. On completion, the Customs official will get you to sign the form and will give you a copy. This form is valid for six months and if you are a frequent traveller, it is bound to make your life easier. The third provisional payment for the 2017/2018 tax year is due on or by 28 September 2018. This payment is voluntary and you only need to make it if you have underestimated your tax liability for the 2017/2018 year. However, don’t forget that making this third payment will save you penalties and interest.